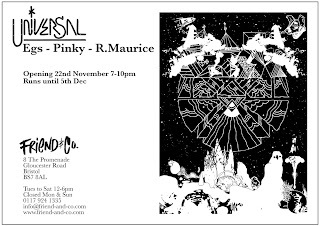 FRIEND AND CO.: EGS, PINKY & R. MAURICE 'UNIVERSAL' SHOW! EGS, PINKY & R. MAURICE 'UNIVERSAL' SHOW! We are really excited about this... On the 22nd of this month we see the start of a group show of brand new work from Egs, Pinky and Russell Maurice. The show is called 'Universal'... There will be original pieces, a limited edition collaborative print and... if you make it down to the opening party on the 22nd, more free beer! EGS, PINKY & R. MAURICE PRINT AVAILABLE NOW!